Today's Draw Classic*: The Ten of Pentacles from the Art of Life Tarot. Are your time and energy eaten by things you don't enjoy? Do have enough time to do the things you enjoy? Is it time for a priority makeover? The quote on this card from John Petit Senn reads, "Not what we have, but what we enjoy constitutes our abundance." 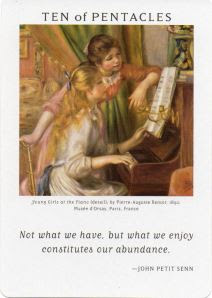 This quote is accompanied (haha) by a Renoir of two girls playing the piano, just living life. We're raised and socialized to work hard so that we'll have "enough". And as soon as we have enough, we see a different "enough" that we need to have. And so on. We don't even think about it. Our quest is automatic. Either that, or we're afraid we won't have enough "if"...if we lose our jobs, if the stock market crashes, whatever. So we hoard and always feel we need more. It's like we've been programmed to think of abundance in terms of money and things, when it's really about experiences and feelings. Today I was thinking about how I have "enough" to take care of this third dog (*this was originally written before I adopted Mystic*) for as long as I'm fostering her. I have enough money, patience, love. And I was also thinking about what I gotten in return. I get to a hero in this little girl's life. And I get to be her surrogate until her real mommy comes along. PLUS I get Kizzie and Magick. And my Best Clients Ever™ and Best Job Ever®. AND I got a really special email from a friend today. And the literal icing on the cake was that I saw these Pillsbury orange sweet rolls at the Safeway. I NEVER buy stuff like that, but I decided to today. I checked the date on the can and I had until late November to eat them. So I figured I'd save them for just the right craving. And you know what? I dropped them on the ground getting them out of my car and the tube ever so slightly popped. They would have to be baked pronto or rot! Is my life great or what??! But it's not like I'm being showered with money while in a hot tub with a nekkid Gilles Marini or anything like that. It's just a normal, ordinary day. No windfalls or surprise packages in the mail. Just the stuff I love all around me. I remember when I first moved into my house. I was really good at keeping everything neat, clean and trim. But then I realized, I hated being neat, clean and trim. I'd rather be doing something else. This was a case of putting what I had in front of what I enjoy. This house? It's just a thing. A really ADORABLE thing that I love, but just a thing. If I had to choose between this house and my dogs...this house and my career...this house and my hobbies....this house and my spirituality...this house would lose. So, assuming I do the needed upkeep, who cares if the windows need washing? Who cares if the bushes out front are a little bushy? I realized one day that I never even look at my house from the outside...haha. My neighbors do, but I don't. So I should be breaking my back for THEIR view? I hired yard dudes. I do the gardening once or twice a year...enough to keep me from being the scourge of the neighborhood. I fix what's broken. Replace what's old. And let perfection slide....so I can focus on what I enjoy. The people across the street? They enjoy their yardwork. So they're out there every weekend doing it. And I get a good view of their yard while I'm in here enjoying all manner of writing, crafting and whatnot. So think about some of the things that are eating your time and energy. Do you enjoy them? Or is there something you'd rather be doing? Trust me, you don't HAVE to clean the house this weekend. Just don't invite anyone over next week and no one will be the wiser. Fill yourself with the abundance of enjoying what you and I'll bet you won't even care.